You can use any bread to make these sandwiches. I found this lovely “Orientale” bread at Grand Frais which has a nice crust but is really soft in the middle but you can use a baguette, some mini buns, some plain focaccia or soft white sliced bread. I made one big sandwich and then cut it into eight portions. Once made, the cicchetti can be set aside somewhere cool on a platter covered loosely with cling film until you are ready to serve them. Slice the large bread lengthways as you would a burger bun. Lay each half open, facing upwards on a clean work surface. Drizzle some olive oil and balsamic vinegar over each half. On the bottom half begin layering the ingredients in this order: basil leaves, mozzarella (season with salt and pepper), prosciutto, sun-dried tomatoes, rocket, chicory and then top with grated or sliced Parmesan (I use a Parmesan cheese plane or a potato peeler). Place the top half of the bread carefully on top of the sandwich and then cut into 8 portions. Cut it in half one way, then into quarters and then finally cut the quarters into halves. 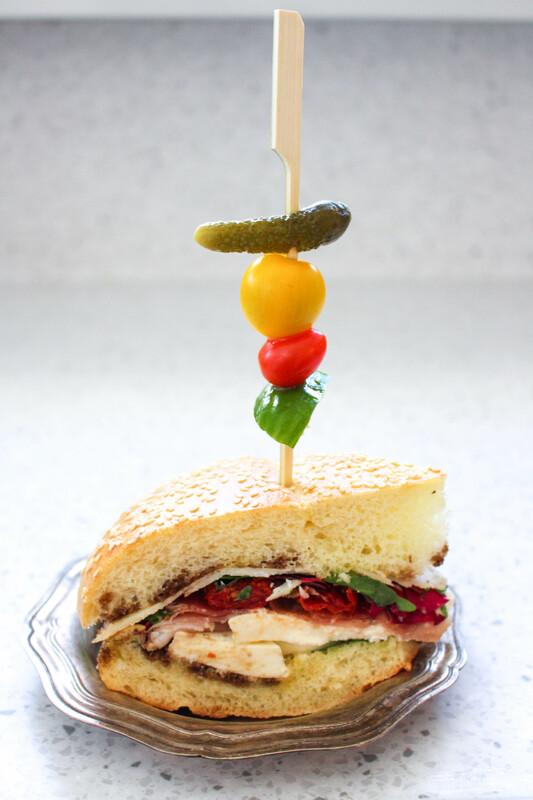 Serve with a skewer to hold the cicchetti in place. I like to garnish my skewer with some vegetables to add some colour. You can use pickles, tomatoes, cucumber, raddish, etc.